Hello Nashville — It’s NRA Show Time! The Exhibit Hall doors opened this morning at the NRA’s 144th Annual Meetings & Exhibits. For the past few days workers have been hustling night and day to set up the large booths and exhibits. Today, industry reps and NRA Members get down to business in the convention center. 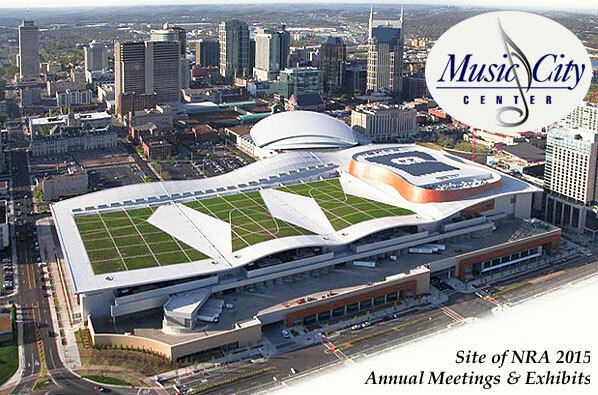 This year the Show is hosted in at the Music City Center in Nashville, Tennessee. Appropriately, on Friday afternoon, show visitors were treated to an outdoor Country Music Jam. Share the post "Hello Nashville — It’s NRA Show Time!" Here’s an important item for shooting range owners and directors of shooting clubs. The NRA’s Field Operations group offers a series of Range Development & Operations Conferences for shooting range operators. In 2011, these are scheduled for: Nashville, TN (March 26-30), Buffalo, NY (June 4-8), and Reno, NV (October 15-19). The next conference is coming up soon — March 26-30 in Nashville. Register online at www.nrahq.org/shootingrange/development.asp. For more information, call 877-NRA-RANGE or email Kara Schlifke at range@nrahq.org. Share the post "Range Development Conference Next Month in Nashville"